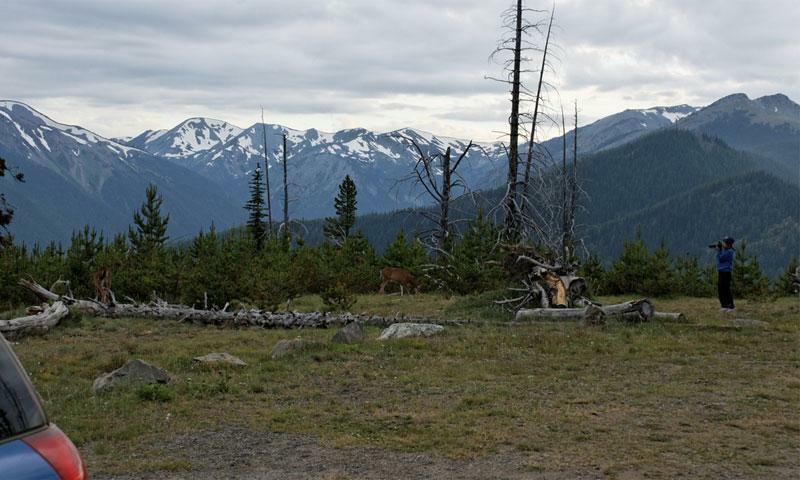 The Deer Park Campground is one of the few elevated campgrounds in Olympic National Park. It is located 5,400 feet up in the Gray Wolf-Hurricane Ridge Group. The unpaved road up to Deer Park is very narrow and steep, but the incredible views of the Olympic Peninsula below make it worth the drive. Deer Park lives up to its name, so plan to bring a food canister with you. FIRST COME, FIRST SERVED. Where is Deer Park Campground located? Deer Park Campground is 30 miles south of the city of Port Angeles. Deer Park Campground can be accessed from Olympic Highway, WA-101 via the Deer Park Road exit. The campground is 16 miles up Deer Park Road. Deer Park Road is a steep, gravel, one lane road and should only be attempted in a sports utility, or functional off road vehicle. How can I reserve a site at Deer Park Campground? Deer Park Campground is first come, first serve; there are no reservations for this site. Tell me more about Deer Park Campground.